Automatically pops a customer’s account information upon receiving a phone call (or chat, text, email, etc.). This gives the agent the opportunity to know the caller before answering and also saves time by providing the agent with call context (name of caller, last purchase, status, etc.). This eliminates the need for manual lookup of customer records and helps to provide your customer with a memorable customer service experience. 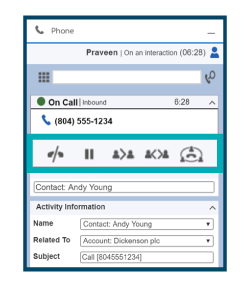 This turns phone fields within Salesforce CRM into clickable links for agents to place outbound calls, eliminating the need for an agent to enter in a phone number manually. 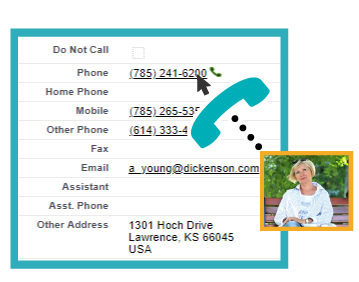 This not only saves the agents time, but ensures they are dialing the correct number. With automatic call and Omni-Channel logging with time stamps, agents can make knowledgeable decisions based on comprehensive and accurate data and access telephony and/ or Omni-Channel reporting directly within Salesforce CRM. Whenever a call is transferred to a different agent, the same account is populated to the next agent. This gives the agent receiving the call all the information, so the customer doesn’t have to repeat information. Call activities are pre-populated or generated automatically to ensure fewer errors and omissions, so administrators have better tracking of agents activities and customer history. This ensures the data that is reported on is accurate, so managers can make data driven decisions that impact the contact center. 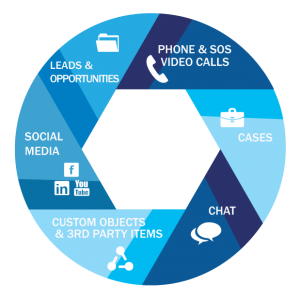 Turns business objects into work items that can be assigned to agent queues in CRM for a truly blended user experience. We enable Salesforce Omni-Channel work items like chat, SOS video calls, leads, case, social media posts, custom objects, 3rd party work items and telephony. Available in both classic & lightning. As a Certified Member of the AppExchange, AMC develops phone and Omni-Channel integration solutions for Salesforce.com™. 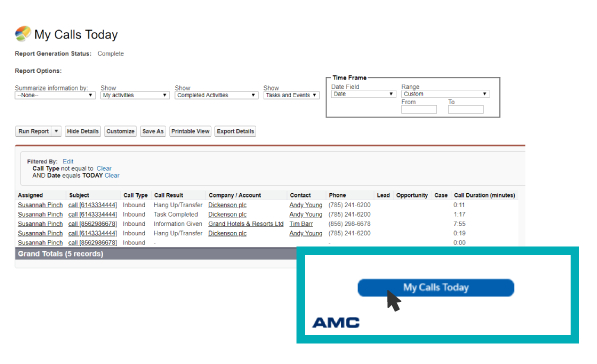 Through the standard Salesforce user desktop and Salesforce Lightning, the Salesforce Service Cloud, and Salesforce Open CTI, AMC provides pre-packaged integration for leading voice solutions including Aspect, Avaya, Cisco, Nortel and others. Please visit the AppExchange website to learn more about our certifications for salesforce.com™. AMC is proud to be a member of the “Power of Us” program. We work with the Salesforce.org™ Foundation to donate licenses to nonprofit organizations to help them reach more people more quickly. Visit their website to find out more about the program, or contact us to see if your organization is eligible for the program. This comprehensive list has over 30+ features unique to our solution, all in one summarized sheet. Read how Canon agents were able to do all work within our toolbar without flipping back and forth between applications. See how we helped Putnam transition smoothly from one platform to another under a very tight deadline, after one of our competitors was unable to finish their project. 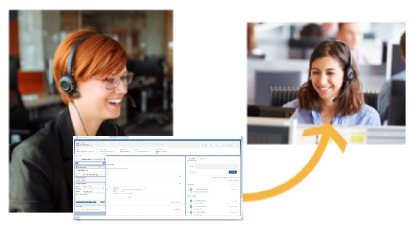 Learn how TriNet was able to decrease agent call handling time by 12-15 seconds per call using our Salesfore solution (what we like to call "Contact Canvas").